Amitabh Bachchan, Shah Rukh Khan, Hrithik Roshan, Ranbir Kapoor, Katrina Kaif, Vidya Balan, Karan Johar. Each of these celebrities are adored and looked up to by millions who aspire to emulate their success stories. But what is it that separates them, and other Bollywood stars, from the rest? Which is that one defining trait that makes them stand out, and how can you benefit from knowing it? 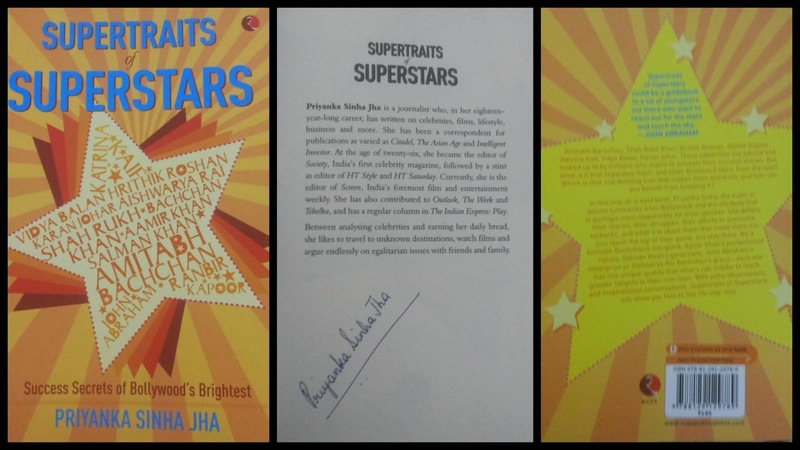 In this one-of-a-kind book, Priyanka Sinha Jha looks at eleven luminaries from Bollywood, and the attribute that is perhaps most responsible for their success. She details their stories, their struggles, their efforts to overcome setbacks, and what it is about them that made them not just reach the top of their game, but stay there. Be it Amitabh Bachchan’s discipline, Aamir Khan’s perfectionist nature, Salman Khan’s generosity, John Abraham’s enterprise or Aishwarya Rai Bachchan’s grace—each star has one unique quality that others can imbibe to reach greater heights in their own lives. With pithy observations and inspirational conversations, Supertraits of Superstars will show you how to live life star-size. Priyanka Sinha Jha is a journalist who in her eighteen-year-long career, has written on celebrities, films, lifestyle, business and more. She has been a correspondent for publications as varied as Citadel, The Asian Age and Intelligent Investor. At the age of twenty-six, she became the editor of Society, India's first celebrity magazine, followed by a stint as editor of HT Style and HT Saturday. Currently, she is the editor of Screen, India's foremost film and entertainment weekly. She has also contributed to Outlook, The Week and Tehelka, and has a regular column in The Indian Express: Play. Between analysing celebrities and earning her daily bread, she likes to travel to unknown destinations, watch films and argue endlessly on egalitarian issues with friends and family. Amitabh Bhachan, Shahrukh Khan, Vidya Balan, Katrina Kaif, Ranbeer Raj Kapoor, Aiswarya Rain Bachan, Aamir Khan, John Abraham, Karan Johar and Salman Khan. Not necessarily in the same order! The cover-page is well laid. It is charming and colorful. So is the design of the back-page. The book burp is simple and to the point. It will surely arouse the reader’s interest. Then comes the careful selection of the actor’s about whom the author has written. They are all very much living and have rose to fame with their own efforts. They all have had their own ups and downs and have faced harsh criticism also. All of them have tasted failure and at the same time faced it courageously. Personally, I am a big fan of almost all of them. I admire them and respect them. And this book gave an opportunity to look into their lives. This book made them so real and human. I really enjoyed the chapters on Amitabh Bhachan, Shahrukh Khan and Vidya Balan. It was truly inspiring. Personally, Vidya Balan’s was the most relatable and inspiring one. I loved the cartoons given in the beginning of each chapter. Each chapter speaks about each actor. And I appreciate the effort put in by the author in compiling the quotes of famous personality and the beauty is each quote gels with the aspect discussed. It tends to become repetitive. It feels like the author is going round and round and is confused about where and how to conclude. Although the book has only 185 pages, it still feels too long and tiring. Editor, where are you? Or did you feel scared to make the book thinner that it already is!